27 paint color combinations were available for 1951 Buicks. Blue, Green and Grey were the most poplular 1951 Buick Colors. Besides the solid paint, new car buyers had the option to paint the roof in a different color. This color combination was called two-tone paint. For an even more individual look, the wheel color could be changed, too. The body tag of your car will tell you the original 1951 Buick Color Combination in which your 51 Buick was painted from the factory. You can compare this number with the ones on this page. If you find a “-1” behind the number, your 51 Buick had the optional wheel color. 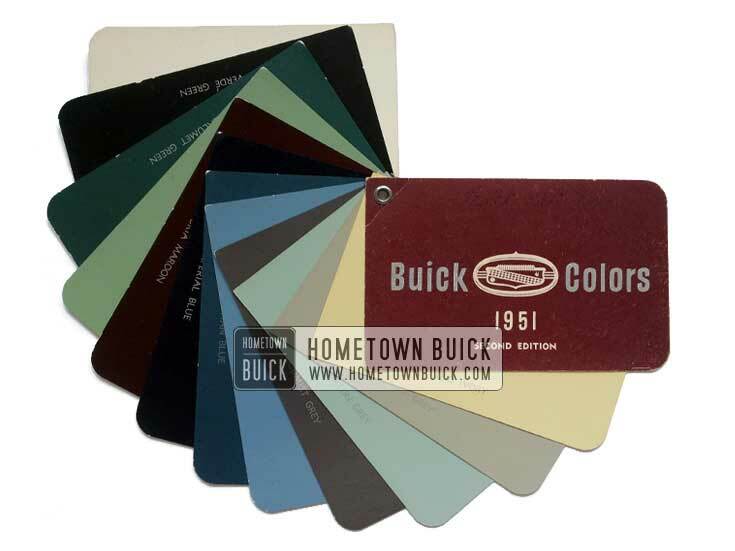 The following 1951 Buick Colors overview reflect the paint combinations at the production start plus new colors that were added throughout the year. Buick made some color changes during production. They were published in the Product Service Bulletins: In the near future, nine new color combinations will be offered on 1951 models. On approximately the same date, five current combinations will be cancelled, three of which are replaced by new colors. The cancelled combinations are as follows: 04, 06, 08, 12, 14. Following are the added combinations, and replacements where applicable: 17, 18, 19 (replaces 04), 20, 21 (replaces 06), 22 (replaces 12), 23, 24, 25. All of the new combinations will carry the Dante Red wheel option. In addition to the nine new color combinations described in BPS 2.301 (published on the 15th of June, 1951), two more combinations have been released for production as follows: 26, 28. Note for Two-Tone Color Combinations: The first color identifies the upper body color and the second color identifies the lower body color.